A Paralympian, a naval hero and the largest collection of health courses in the South West are the highlights of an upcoming event at the University of Plymouth. 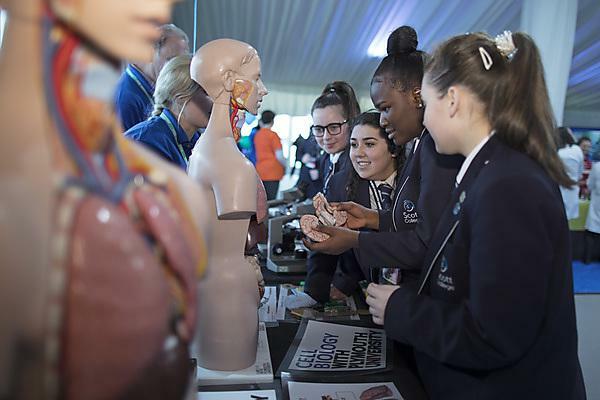 Taking place on Thursday 18 October in partnership with Next Steps South West (NSSW), the Health Showcase welcomes schoolchildren to inspire them into health and medical careers, from nursing to neuroscience, dentistry to dietetics and psychology to social work. The life-changing teaching and research at the institution is also available for members of the public to view during the evening, free of charge, from 5–6.30pm. Coinciding with the 70th anniversary year of the NHS, the day session is being run in partnership with NSSW, the collaborative outreach network that includes universities and colleges from Cornwall, Devon and Somerset and delivers impartial information and support to ensure that young people receive equal opportunities whatever their circumstances. The day welcomes Paralympian David Hill, from Exmouth, who was born with no left forearm but was brought up to believe there was no such word as ‘can't’ – becoming a two-time Paralympian in swimming and triathlon, World and European medallist, British Champion and Top 10 Finisher in the Rio de Janeiro 2016 Paralympic Games. In the evening, guests have the chance to hear from Surgeon Captain Jason Smith Royal Navy, a Consultant in Emergency Medicine at University Hospitals Plymouth NHS Trust, who has undertaken several deployments to Iraq, Afghanistan, Sierra Leone, and, most recently, South Sudan. “The first time I saw a patient with blast injuries was a pivotal moment in my career. I had been a registrar in east London and had seen my fair share of major trauma, but this was on a different scale. I was in Iraq in 2003, working in a Royal Navy medical treatment facility, when we received patients who had been injured by an explosion. The severity of injury, and sheer destructive capacity of explosives really came home to me. As a result, the management of blast injuries is one of the key research topics that I have been involved in since. Other institutions present on the day include City College Plymouth, Plymouth Marjon University, Livewell Southwest, Guide Dogs for the Blind and University Hospitals Plymouth NHS Trust. We’re proud here at Plymouth to offer the largest range of health courses in the region and it’ll be great for students to meet the people who are in the jobs, doing the research, and ultimately teaching them if they decide to come here.